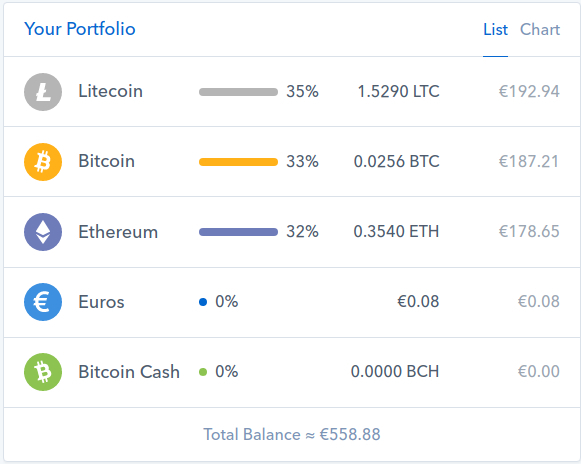 I’ve bought the 3 Cryptocurrencies Bitcoin, Litecoin and Ethereum in September 2017 at Coinbase for €300 Euros. A few weeks later they had a Value of over 1000 Euros, but the last few months they all kind of crashed. To be honest I have no idea where they will be in a year or in 10 years. But I’m not going to sell them. It’s a 300 Euro Investment. Maybe they will be worthless in 10 years or have a value of over 10000 Euros. Nobody knows. These are the only Cryptocurrencies I’ve ever bought and I’m not going to sell them in less than 10-20 years. The good thing in Germany is that I don’t have to pay Tax on my Gains if I hold them for more than a year.